I want to understanding juicing, I really do. Especially since I’ve heard so many health claims out there about having more energy, eating clean, etc. etc. when you juice it up. Funny how we don’t hear about these claims during graduate school, huh? Or maybe we did and I missed that day. Regardless, many nutrition sites out there boast the benefits of juicing and that it is the thing to do to get your bod in prime health. The claims state this: Cooking destroys food’s nutrients and enzymes that our body would otherwise use for bodily functions. Therefore, juicing allows us to absorb all of the nutrients that these fruits and vegetables have to offer in their raw form. Juicing is easier on your body, specifically the digestive system, since drinking your extra large salad per se will elicit fewer gastrointestinal symptoms than eating it by the forkful. 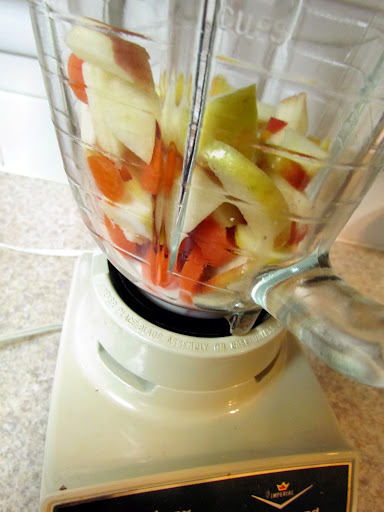 Juicing makes it easier to get in your fruit and vegetable servings each day. Doesn’t this mean that digestion would be easier due to less fiber in the resultant juice? I’ve never actually seen a juicer, but I would be curious to find out where all of the fiber is going – either sitting helplessly among the crevices of the juicer machine or in the juicee, AKA person drinking the juice. 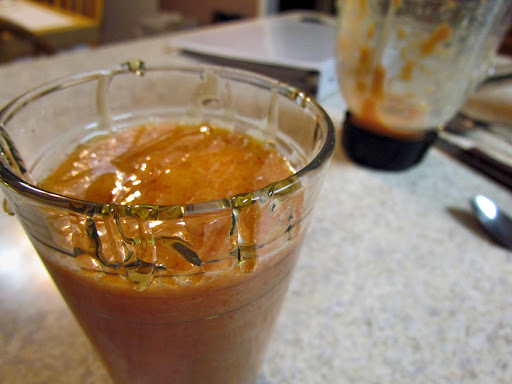 I would like to think (and hope) that when juicing, the ENTIRE fruit or vegetable is sucked through the juicer (without seeds and stem, of course) with the peel in order to get that fiber in the juice. And if there is fiber left behind in the nooks and crannies of the juicer, hopefully they are dumped into the glass of juice for consumption. That green one on the right looks like it has fiber in it, the others…not so much. However, I do suppose that if you are going to drink juice, making your own fresh juice without added sweeteners is the way to go. 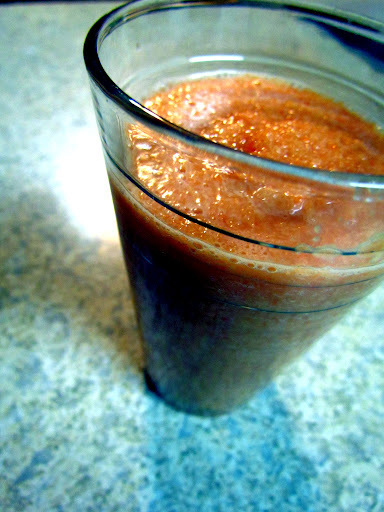 Not to mention the fact that juicing allows for an endless array of juicy combinations. Spinach, apples, bananas, oranges, carrots, wheat grass, celery, cucumbers, fennel, lettuce, mangoes, and the list goes on and on. This means that you are getting the nutrients from these fruits and vegetables (in a novel way) that you might not necessarily be inclined to consume if you were to eat them whole. But. What about the fiber? Fiber or not, I thought I’d give it a whirl. 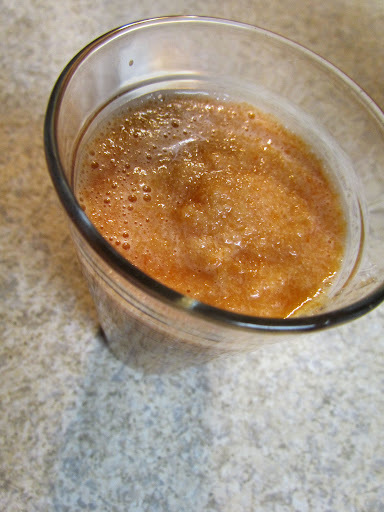 Already knowing that I like the combination of carrots and apples together, I cut up an apple, chopped up a carrot, splashed in some almond milk, and threw it all in the blender, since I do not own a juicer. Then I would be sure to get my fiber, too! Disclaimer: Yes, yesss, this very fact might mean that I had an inaccurate first time “juicing” experience without the correct equipment, but it was the best I could do. I was hopeful, yet skeptical. “It doesn’t look so bad!”, I thought as I peered into my glass. “And you like the color orange,” I reminded myself. However, perhaps my mistake was staring at my fibrous drink, which was happy to see me, and chock full of vitamins A, C, and approximately 10% calcium, for a few seconds too long. And I don’t mean gulping down my carrot-apple juice. Maybe adding a little Winnie the Pooh action would help? Sigh. It would’ve been so much easier to eat my carrots and chomp through an apple. However, I want to try a decent juice from a juicer, I really do! So, fellow readers, if you know of a delicious juice concoction for a first time juicer, hit me up! I want to taste what all the rage is.